Hear ye, hear ye! 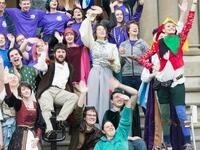 Whitman College proudly presents the 50th annual Renaissance Faire! This year’s faire will be held on April 20th, from 10:00am-5:00pm on the Whitman College campus, in front of Memorial Hall (the corner of Boyer Avenue and South Park Street). Admission is free so bring the whole family and enjoy live music and theater performances, unicycle jousting, and many talented local merchants and performers. See you at the faire!